Please note that the NJ Hiking: Connect site is inactive. The site will be up for archival purposes but is not active - we're not accepting new members or adding to the content. The site may still shut down at any time if the forum software company makes changes as planned but are currently on hold. 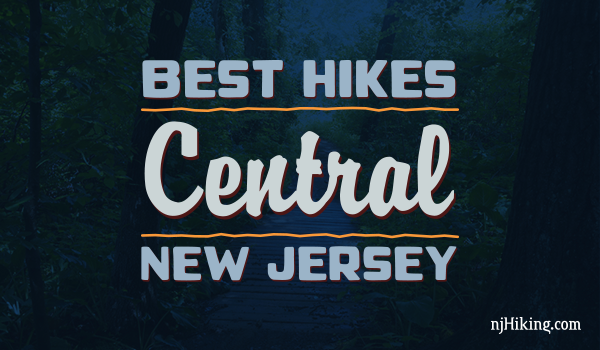 Please note that the NJ Hiking: Connect site - http://connect.njhiking.com - will permanently shut down on October 1, 2016. Moderate hike that takes in a viewpoint from historic Washington Rock, Hemlock Falls, and the Rahway River. Historic Fun Fact: Washington Rock is where a signal beacon warned the Army at Morristown of the British Army's approach. Easy trail that skirts the edge of Lake Mercer, travels through woods and along fields and streams. 5.0 miles, easy surface: packed dirt, some roots/mud, mostly level. Expansive views from a fire tower and Big Hill, a few ruins, and hiking old woods roads past three pretty reservoirs. Miles: 7.0; rugged, rocky trails with some decent hills. Hike through a beautiful section of the pine barrens and around old cranberry bogs. Easy, flat, no elevation changes. Soft sand and pine needles, some potentially soggy areas, a few water crossings on logs. 7.7 miles – this route, RED and GREEN trails. Views of the NYC skyline (Ilgenstein Rock) and of Wanaque Reservoir (Erskine Lookout) are along this hike in Ringwood State Park. 9.5 miles. Moderate. Typical rugged Jersey trail surface. Update 11/20/15 - Description and GPX updated, foliage photos added. Pretty, well-maintained trails that are best for short loops plus a visitor center and small reptile house. 5 miles to do the perimeter of the park, minus the farm trails. Surface is packed earth with exposed roots, few rocks. Some minor hills along Many Log Run. Hike through fields and forest around Swimming River Reservoir and Marlu Lake in Monmouth County. Trail surface: mostly easy; some very prominent roots, especially in the beginning, and grassy areas can be quite muddy. Mostly flat, no big elevation changes. Moderate hike that includes a view of the Delaware River and passes old farm buildings and the Kuser Estate House. 8.1 miles. Easy to moderate trail surface; minor elevation change. Some muddy/rutted trail sections due to use by bikes/horses. The trail is mostly hard packed earth, with some rocky areas. Hike boardwalks, a suspension bridge, hardwood forest, fields of wildflowers, train tracks, a cow pasture, a boulder field... before steeply climbing the “Stairway to Heaven” to one of the best viewpoints in NJ: Pinwheel Vista. Scramble through the Lemon Squeezer – a narrow rock crevice on the Appalachian Trail – and hike past Island Pond, Boston Mine, Green Pond, and the Valley of Boulders. 8.2 miles; moderate. Rugged and rocky trail surface, but other than the Lemon Squeezer area, no real scrambling. Nice views of rural Northern NJ from Sunrise Mountain and along the Appalachian Trail, plus hiking through a dense forest. Challenging loop that combines a section of the Four Birds Trail with the Splitrock Trail to circle Splitrock Reservoir. Enjoy views of the reservoir and Misty Pond from Indian Cliffs. 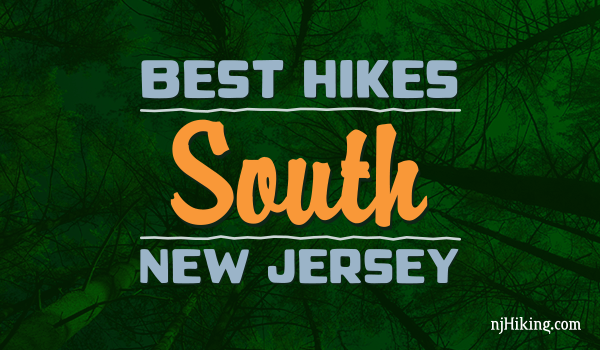 This challenging loop is one of the most difficult hikes in NJ. Challenging hike to the summit of Mt. Tammany and then to Sunfish Pond in the Delaware Water Gap. Steeply climb to the summit of Mt. Tammany (1527') for amazing views over the Delaware Water Gap, then follow the Kittatinny ridge along a fire road before heading over to beautiful Sunfish Pond. Return is via the scenic Dunnfield Creek Trail. Small county park with a very nice trail system through a pine forest with several short, easy loops – or combine all for a 5.0 mile hike. Trail surface: Very easy: level and soft pine needles, with boardwalks to cross brooks and wet areas. Some overgrown grassy areas after crossing Pleasant Valley Road. A long route on mostly woods roads to a fire tower, or take it easy with short trails, picnic tables and playgrounds. Trail surface: Moderate. Lots of level woods roads, with some steep sections. This park is multi-use. This moderately challenging loop combines pleasant forest walking with rocky scrambles and passes by pretty Terrace Pond. 4.8 miles – Rugged, rocky surface with some scrambling.